There aren’t many expectations that one carries from the music of Firangi, reason being that the promotion has been largely low key and there hasn’t been much of a buzz around the soundtrack. A couple of songs that have been released already aren’t burning the charts either and hence one waits to check out what do composer Jatinder Shah and lyricist Dr. Devendra Kafir have to offer in rest of the album. 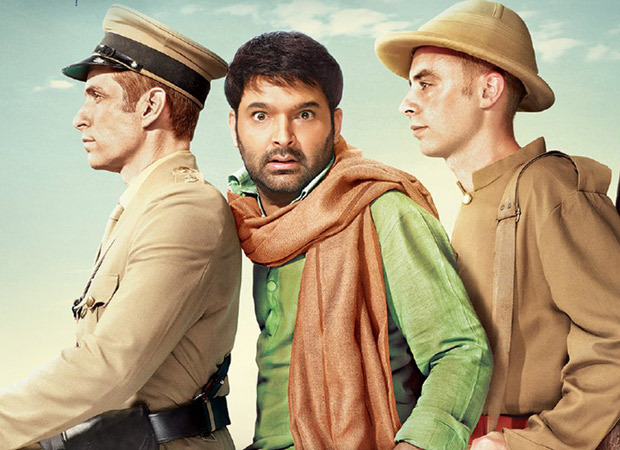 There is a 40s and 50s feel to the title song ‘Oye Firangi’ which kick-starts the proceedings, and that makes sense too since the film is set in pre-independence era. Sunidhi Chauhan brings her experience into play while rendering this track that has a sweet feel to it and should add on well to the film’s narrative. This is not the kind of song that would live on long for months to come but fits in well for the moment. Jyoti Nooran’s trademark boisterous vocals are up for display with ‘Sajna Sohne Jiha’ that has a feel good aspect to it that keeps the energy going. There is traditional folk appeal which the song carries and the fast pace helps too, hence ensuring that there is good momentum right through this three and a half minute piece. There is a back-up vocalist as well who does a good job but surprisingly she is not credited. ‘Sahiba Russ Gayiya’ is the next track to arrive and this one has Rahat Fateh Ali Khan coming behind the mike. A soothing number that belongs to the ‘roothna-manaana’ genre, this Dr. Devendra Kafir written track is nicely worded and has the ‘antara’ portions even better than the ‘mukhda’. One just hopes that the song is more aggressively promoted so that it has a better reach amongst audience. Later, an ‘unplugged version’ by Shafqat Amanat Ali appears as well and only helps in adding on to the recall value. Unfortunately though, a lot of good work is undone with the arrival of utterly avoidable ‘Gulbadan’ that comes in next. A ‘mujra’ number by Mamta Sharma, this one has a classical touch to it but you aren’t really excited to check it out right till the end. Written by Ashraf Ali & Krishna Bhardwaj, ‘Gulbadan’ falls into the category of quick-skip category and one just hopes that the last song to arrive makes up for it. Daler Mehndi is the man behind ‘Tu Jit Jawna’ which concludes the album. A Punjabi-Hindi number which is about encouraging an individual to go for the task in hand and excel there, it has the hook of ‘Firangi’ which is on the same lines as the title song ‘Oye Firangi’. One expects this number to appear in the film around the pre-climax or climax. The soundtrack of Firangi emerges as better than expected. Except for ‘Gulbadan’ which is a misfit in the state of affairs, rest of the songs blend in well with each other, hence resulting in a largely satisfying album.